Pool safety and dogs are an extremely important thing to consider this Summer. Puppies and dogs can drown very quickly. 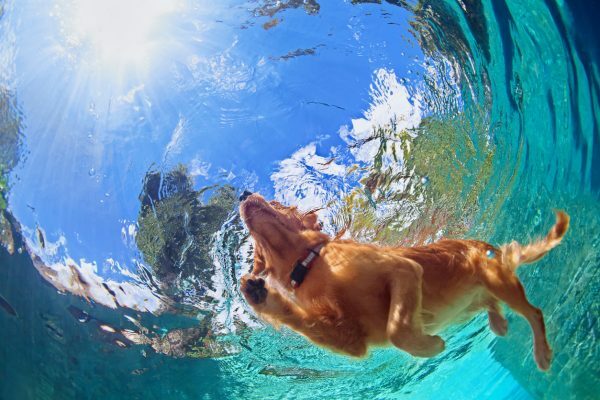 Most dogs can swim, however if they can’t get out of the pool they can very quickly become exhausted and stressed. It is a good idea to teach your dog where the steps are this can be done by putting your dog on lead at several points in the pool and guiding your dog or puppy over to the steps. Have a family member sitting at the steps calling the dog to that area, with plenty of praise and allow your puppy or dog to climb out unaided. Only 2 or 3 times. Do not exhaust your dog. We do not advise doing this with puppies under 12 weeks. Make sure you’re dog can climb out of the pool ie. there are steps it can reach and get some grip when wet. It is important to always keep gates closed and supervise your small puppy at all times when out in yard.